Look at the top 5 cards of your deck and put them back in any order. Flip a coin. If heads, this attack does 60 more damage. This attack does 80 more damage for each Prize card your opponent took on their last turn. 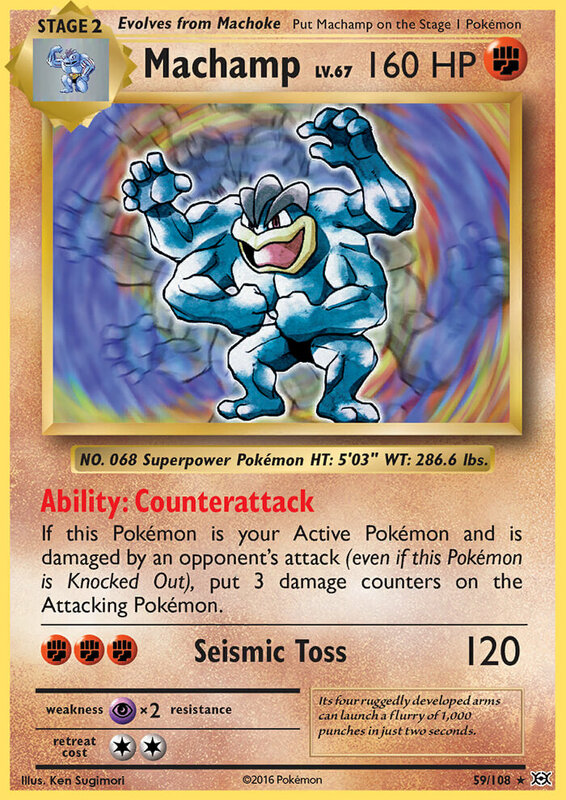 If this Pokémon is your Active Pokémon and is damaged by an opponent’s attack (even if this Pokémon is Knocked Out), put 3 damage counters on the Attacking Pokémon. Each of your [F] Pokémon’s attacks do 20 more damage to your opponent’s Active Pokémon (before applying Weakness and Resistance). 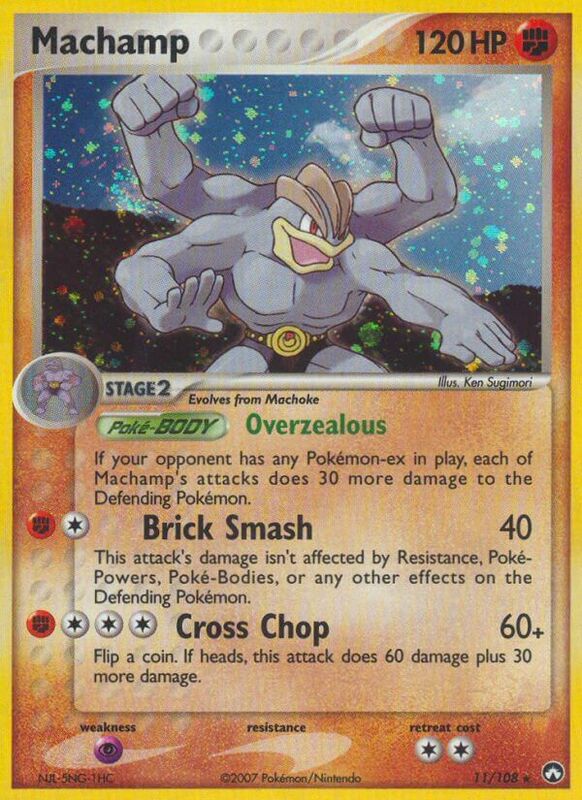 During your opponent’s next turn, any damage done by attacks from the Defending Pokémon is reduced by 40 (before applying Weakness and Resistance). Discard a random card from your opponent’s hand. 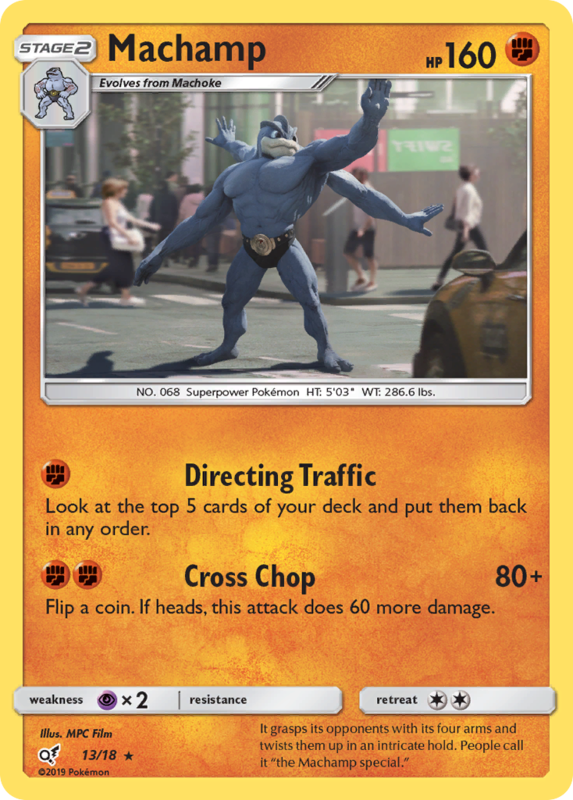 If this Pokémon has a Pokémon Tool card attached to it, this attack does 40 more damage. The damage of each of your [F] Pokémon’s attacks isn’t affected by Resistance. Flip a coin. If tails, during your opponent’s next turn, any damage done to this Pokémon by attacks is increased by 30 (after applying Weakness and Resistance). 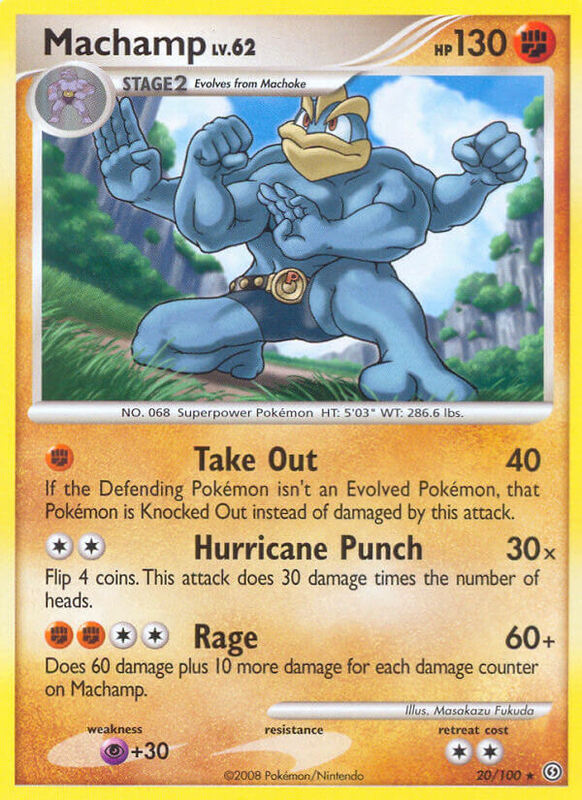 Flip a number of coins equal to the number of damage counters on Machamp. This attack does 20 damage plus 10 more damage for each heads. Using its amazing muscles, it throws powerful punches that can knock its victim clear over the horizon. You may do 40 damage plus 20 more damage. 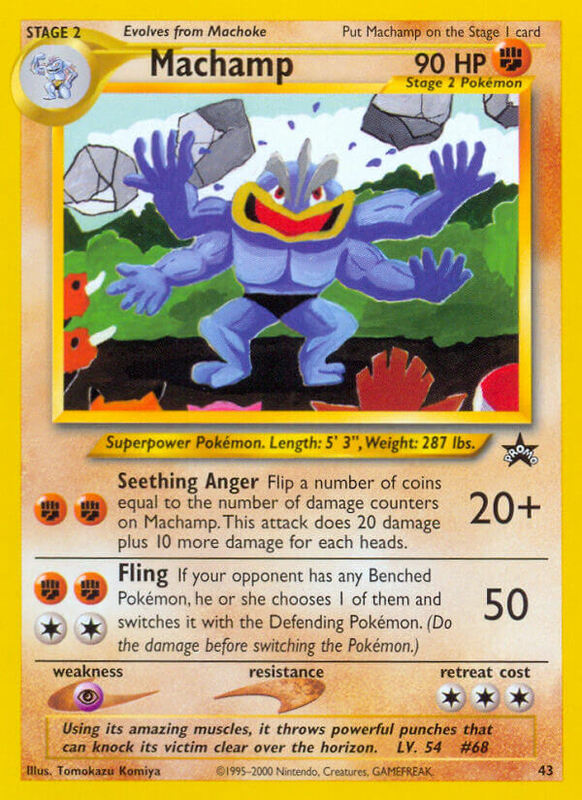 If you do, Machamp does 20 damage to itself. 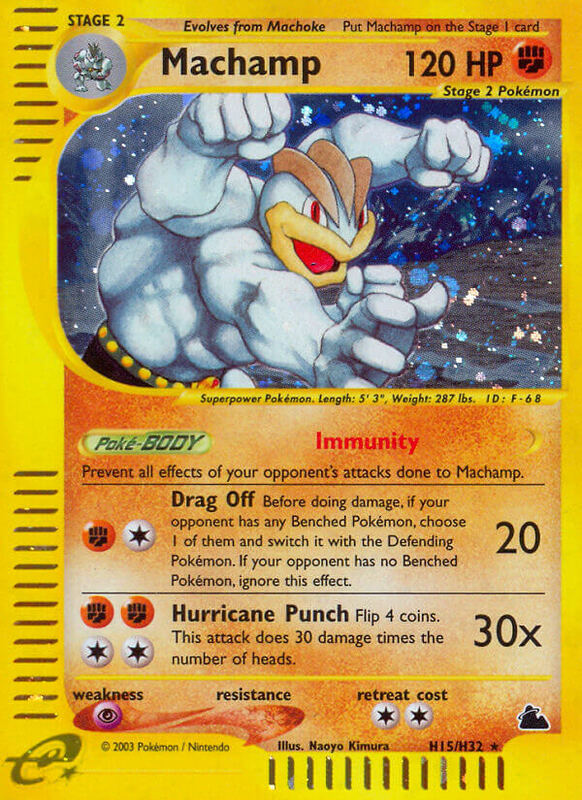 Does 60 damage plus 10 more damage for each [F] Energy attached to Machamp. 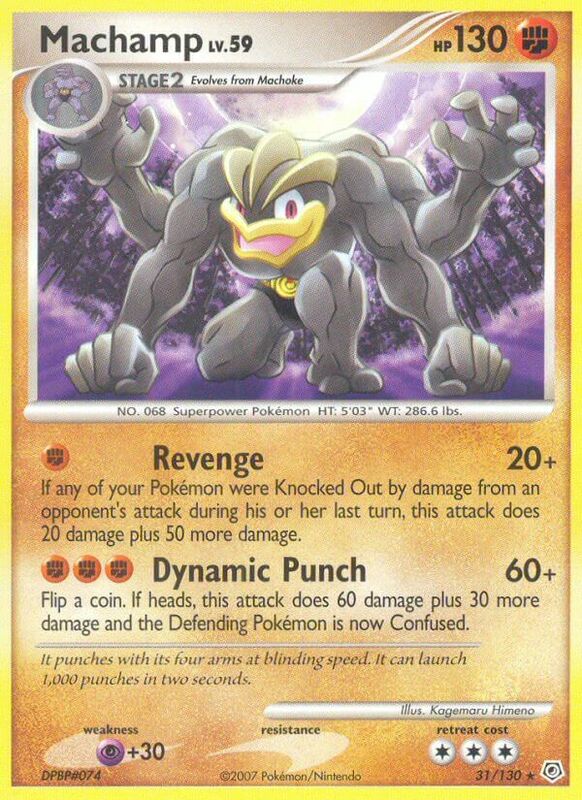 If any of your Pokémon were Knocked Out by damage from an opponent’s attack during his or her last turn, this attack does 20 damage plus 50 more damage. Flip a coin. If heads, this attack does 60 damage plus 30 more damage and the Defending Pokémon is now Confused. 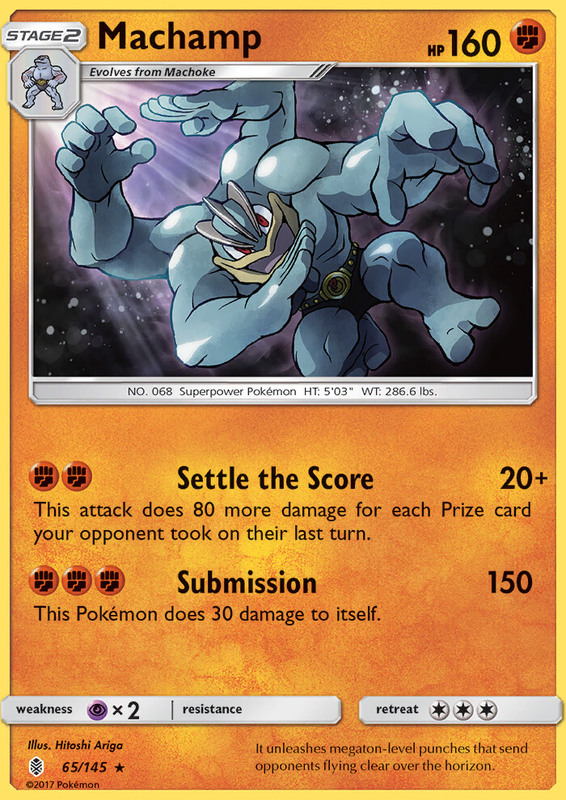 If your opponent has any Pokémon-ex in play, each of Machamp’s attacks does 30 more damage to the Defending Pokémon. Flip a coin. If heads, this attack does 60 damage plus 30 more damage. Discard a Special Energy card, if any, attached to the Defending Pokémon. 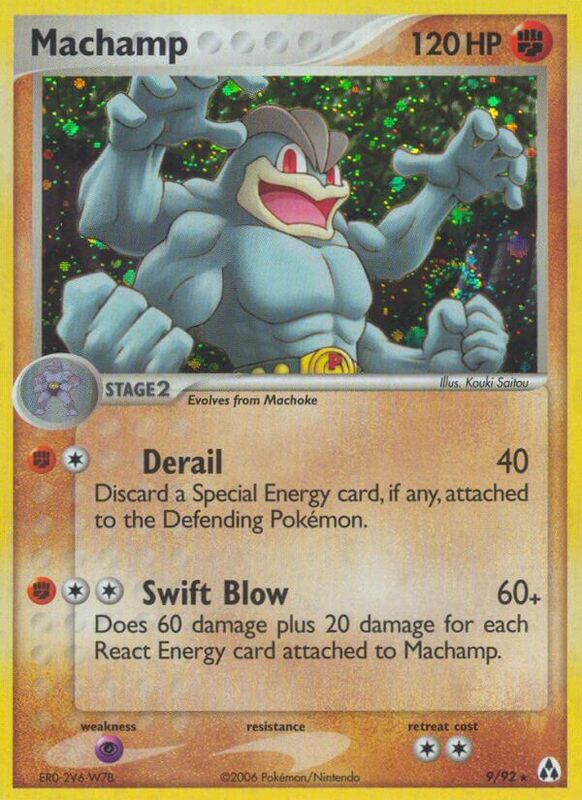 Does 60 damage plus 20 damage for each React Energy card attached to Machamp. 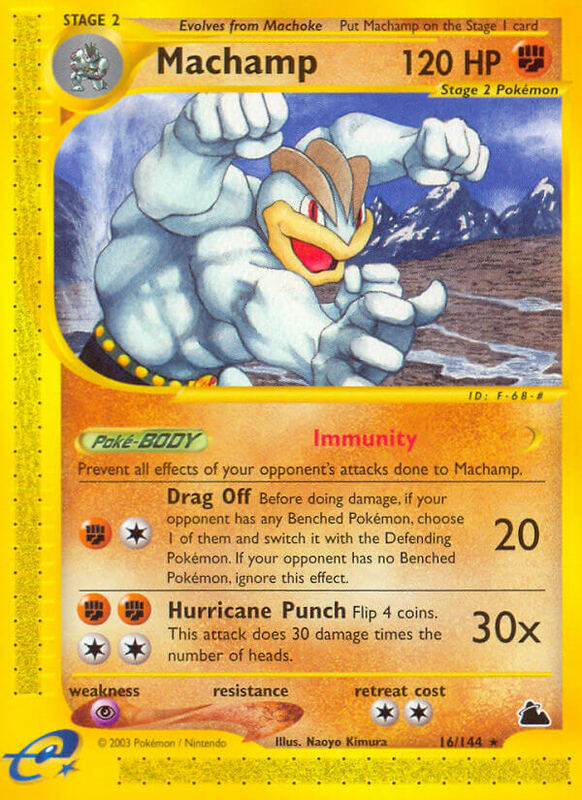 If your opponent has any Pokémon-ex in play, each of Machamp’s attacks do 30 more damage to the Defending Pokémon. Flip a coin. If heads, the attack does 60 damage plus 30 more damage. 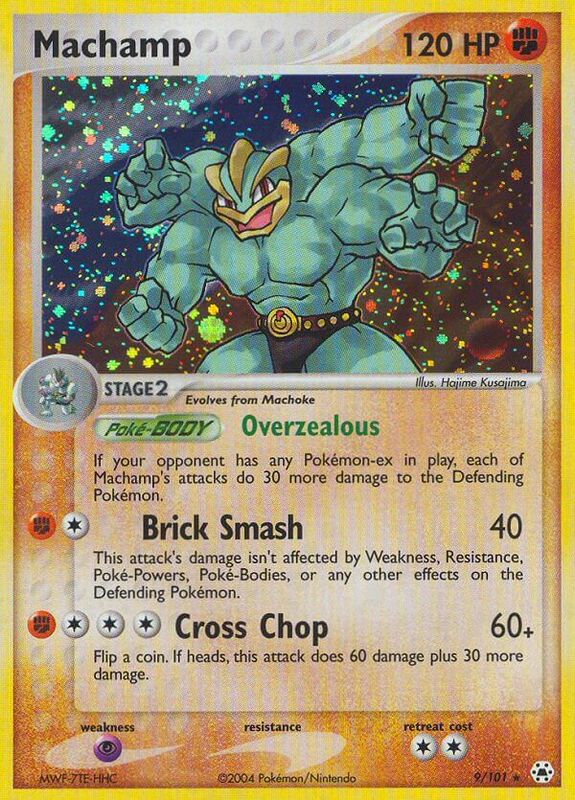 Prevent all effects of your opponent’s attacks done to Machamp. Before doing damage, if your opponent has any Benched Pokémon, choose 1 of them and switch it with the Defending Pokémon. 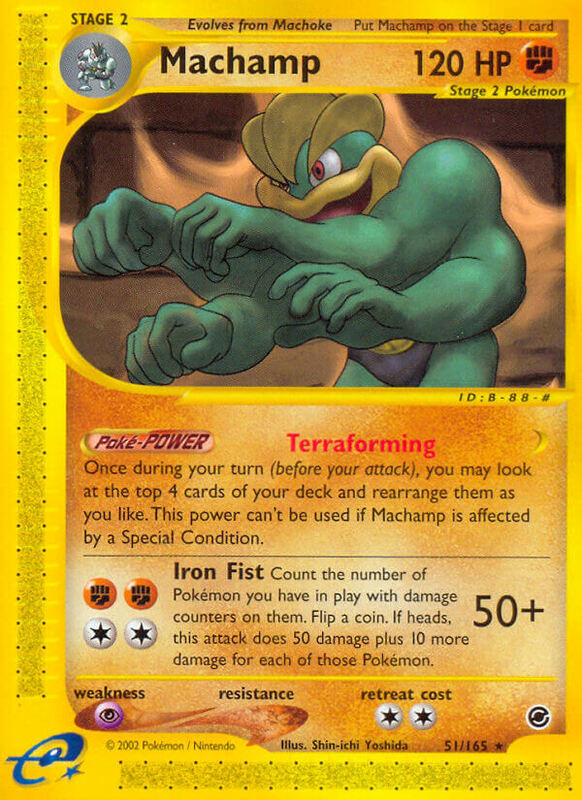 If your opponent has no Benched Pokémon, ignore this effect. Once during your turn (before your attack), you may look at the top 4 cards of your deck and rearrange them as you like. 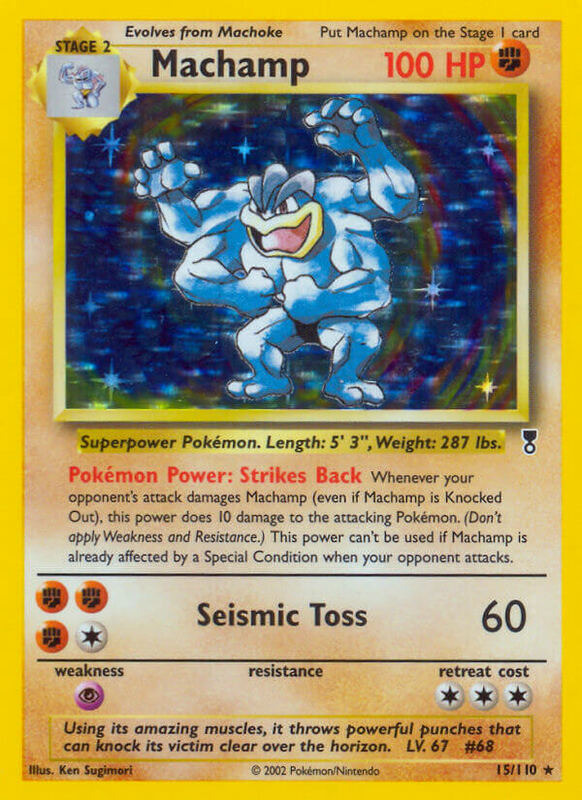 This power can’t be used if Machamp is affected by a Special Condition. Count the number of Pokémon you have in play with damage counters on them. Flip a coin. If heads, this attack does 50 damage plus 10 more damage for each of those Pokémon. 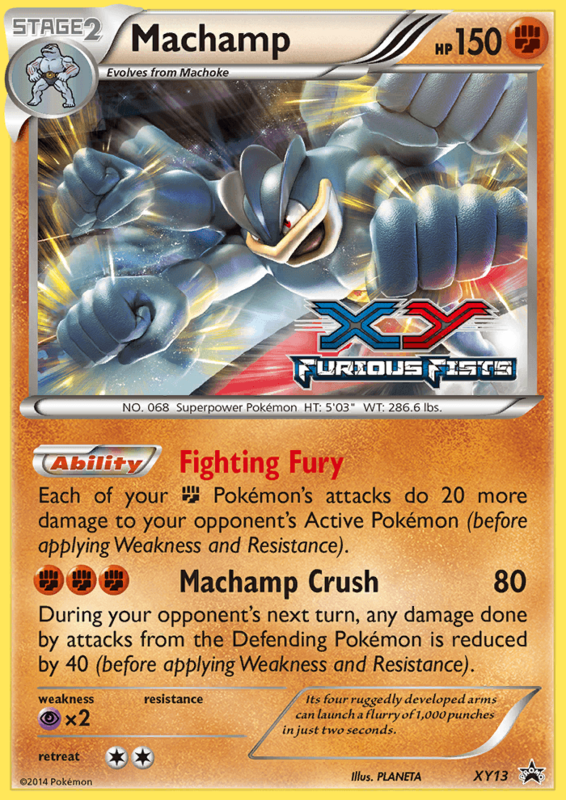 Whenever your opponent’s attack damages Machamp (even if Machamp is Knocked Out), this power does 10 damage to the attacking Pokémon. (Don’t apply Weakness and Resistance.) 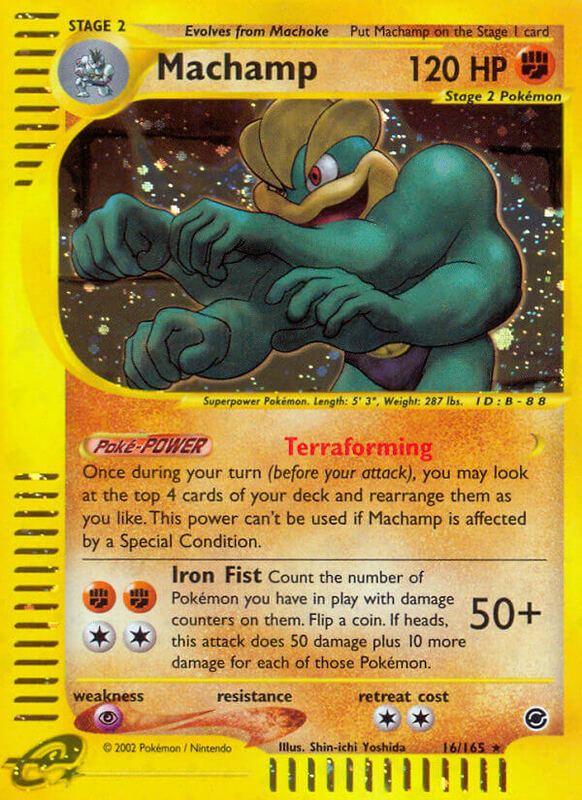 This power can’t be used if Machamp is already affected by a Special Condition when your opponent attacks.